Dr. Syed Afsar Ali is an young enthusiastic physician doing his post graduation at National Institute of Homoeopathy Kolkata, West Bengal. 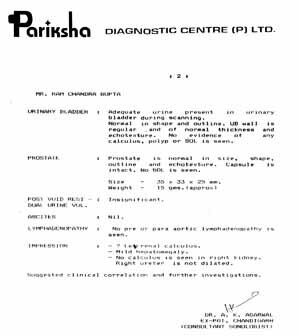 He is highly dedicated for the development of Homoeopathic System and he presents a case of case Nephrolithiasis. Pain in right loin from last 10 months to 1 year. The pain is mild in nature. better little from urination, by rubbing on the region. Frequent urination though small in amount. There is a history of passing tiny particles through urine. Indigestion with acidity and flatulence from last 2 years. The complaints aggravated in afternoon and last up to 6 or 7 pm. Nauseating tendency in morning, sour taste in mouth, sour eructation, occasionally sour vomiting. General sensations and complains (including burning etc.) Burning in palms and soles. Intolerance to tight clothing. Perspiration: from arm pits, sweaty warm palms & soles. Bowel: on alternate days, unsatisfactory, hard offensive. Urine: offensive, frequent of little quantity. Burning at beginning of urination. Sleep: Sound. Sleeps on rt. Side. Feels worse after waking in morning. Taste: Sour taste in mouth. Fair complexioned, wrinkled in the skin of forehead. Average body built. Pulse-78 /min. BP-130/80 mm. of Hg. Resp.-22/min. Sweaty warm palms and soles. Tongue large flabby, salivated, trembling. Rest within normal limit. Systemic Examination: P/A- NAD except mild sore ness on right loin on palpation. Mind - Anxiety – future about. Mind – Memory - weakness of memory. Generalities – food and drinks – sweets - desire. Generalities – Food and Drinks – Salt – desire. Generalities – Food and Drinks – warm food – desire. Generalities - cold, taking a- tendency. Urinary organ – urine – odor – offensive . Calc. 23/15, Sulph 23/15, Ars 20/15, Chin 20/15, Kali carb 18/15, Phos 24/15. Though Sepia carries the highest mark during repertorisation, prominent generalities are covered by the polycrest medicine Lycopodium. Lycopodium carries 28 marks covering 15 symptoms, it was selected as the final medicine for prescription as it covered the important characteristic physical generals and characteristic particulars. 26.04.08 little better regarding uneasiness in the loin, acidity and flatulence The complaints have decreased in intensity. As the patient was improving under Lycopodium he was given the same upto 0/10 in the same manner till September. Pain in right loin is absolutely absent, appetite is improved, acidity and flatulence is better. No burning in palms and soles. Sound sleep with feeling of refreshness on waking in morning. 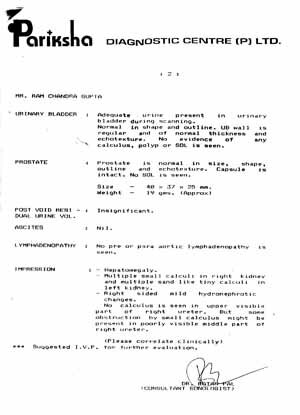 He was advised to do USG of whole abdomen which reveals the following report-01/09/08 Mild Hepatomegally(?) Left renal calculus. No renal calculus is seen in rt. Kidney. No hydronephrotic change. Right ureter is not dilated.